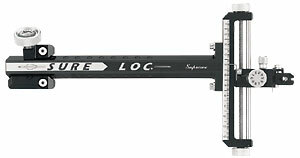 Sure-Loc Supreme 400 Target Sight Archery Supplies Australia's largest and Best Archery Equipment warehouse. The SUPREME sight is the lightest, strongest, and most accurate sighting system for the compound bow to date. This sight features the no-lock design with patented, accurate tracking system that will always stay exactly where you set it. It is also micro-adjustable in very accurate and repeatable .002" increments. Our unique split block design allows you to make the switch from one scope to another or to the pin attachment in a snap! Hi, im a beginner user for compound. I need some advice for sight that i need to use for target. This surelock target 400 are include the scope n lense? how much for the complete stuf, so it will ready to used.